The 2nd annual Bootlegger 10K trail race will be held on Sunday, February 17th, on upper Creve Coeur Park's Bootlegger's Run trail, which gets its name from the area's notorious reputation during Prohibition. According to one account, "Prohibition brought gamblers and gangsters back and clubhouses, roadhouses, and the notorious Creve Coeur Hotel provided havens for crime.” ﻿Another history offers, "Around the 1920's the area began to decline in popularity as gangsters and hoodlums began to frequent the saloons, restaurants, and nightclubs located at the lakefront. By the end of Prohibition, Creve Coeur was almost exclusively a gangster hideout." Today, Creve Coeur Park has regained its pre-Prohibition notoriety as a beautiful locale for enjoying nature. It is regularly filled with St. Louisans running or biking the trails, riding zip lines at Go Ape, sailing or rowing on the lake, or simply having a picnic. The beautiful Bootlegger 10K course is primarily single-track trail and includes plenty of turns, switchbacks, and hills. Look closely and you may see remnants of the Creve Coeur Lake streetcar line that brought ne'er-do-wells to the area during Prohibition. Add winter weather to that mix and the Bootlegger 10K will surely test your will against Mother Nature at her toughest. Keep it lawful on the trails and you won’t have to smuggle out your one-of-a-kind finisher stainless steel barrel mugs! Date | Sunday, February 17th, 2019. 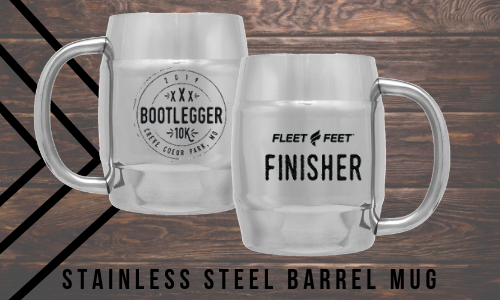 Finisher Beer Stein Mug | Finishers will receive a custom 14oz Stainless Steel Barrel Mug. Course | The course is well planned with a 1.5-mile parade loop on Streetcar Drive to “naturally” sort the field by pace prior to entering the trail. Runners will complete a full loop counterclockwise and then return to the start/finish line at the old streetcar ‘loop’ building. This course also has about six great spectator locations within a quarter mile walk – if your loved ones would like to see you suffer. To avoid overcrowding on the trail, registration is limited to the first 500 entrants. Click here to register. $5 | VIP Parking | Limited VIP parking is available to participants in the upper parking lot near the pre/post race area. Proceeds from parking will benefit a local charity. Participants who do not purchase VIP parking will park in the lower lots off Marine Ave and have a 1/2 mile walk to the pre/post race area. 2/16 | 11:00am - 5:00pm | Six Mile Bridge Beer - 11841 Dorsett Rd, Maryland Heights, MO 63043. More parking is available around the back of the building if the front lot is full. If you are coming from out of town and cannot pick up your packet until race morning, please download and carefully read the Race Instructions (coming soon) before race morning. Your race number will be waiting for you at the race start. VIP Parking | Purchase VIP parking for $5 and help support Washington University Women's Ultimate. VIP parking will be located in the upper parking lots off Streetcar Dr near the pre/post race areas. Free Parking | Is available in the lower lots at Creve Coeur Park off Marine Ave. These lots may have up to 1/2 mile walk including stairs to access pre/post race area in the upper portion of the park. Charity Partner | Proceeds from VIP parking will support this year's charity partner Washington University Women's Ultimate. WUWU (Washington University Women's Ultimate) is a close-knit, competitive team of female athletes who start out with varying levels of experience with ultimate frisbee. We attend tournaments in the midwest and across the country throughout both fall and spring seasons. We strive to become better players and people through our values of teamwork, respect, and self-growth. We strive to be the best we can be, on and off the field. Awards will be awarded to the top three male/female overall finishers and the top three male/female in the following age groups: 20 & under, 21-29, 30-39, 40-49, 50-59, 60-69, 70+. Volunteer | Interested in volunteering for Bootlegger Trail Race? All volunteers will receive a Stainless StellSteelel Mug and a gift card to Fleet Feet, along with refreshments and lots of thanks and praise! Have a group interested? Contact Jules (jules@fleetfeetstlouis.com) for more information and details. Donations available for groups of 10 or more. REFUND and TRANSFER POLICY | No refund within two weeks of an event. No make-up date if the event is canceled due to weather. Entries are not transferable to another event but can be transferred to another participant. Transferring registration is allowed until 2/11/2019.